Warwickshire have put three of their most promising youngsters on academy development contracts for the 2016 season. Irish all-rounder Mark Adair, 19, slow left-armer Sunny Singh, 19, and former Worcestershire junior Ed Pollock, 20, a middle-order batsman, have all signed. All three players will be part of Dougie Brown's first-team squad. "We're hopeful that giving them more experience will ensure that they continue to develop," said Brown. "They have exciting futures in the game," added the Bears director of cricket. "Mark, Sunny and Ed will form an integral part of the squad for the 2016 season and hopefully push towards full contracts." Belfast-born Adair, who made his first-class debut in last season's final County Championship game against Somerset at Taunton, joined Warwickshire's academy the end of the 2012 season. India-born, Birmingham-bred Singh, who joined the academy in 2013, has been a Second XI regular for the past two seasons. He has spent this winter at the Darren Lehmann Academy in Adelaide. 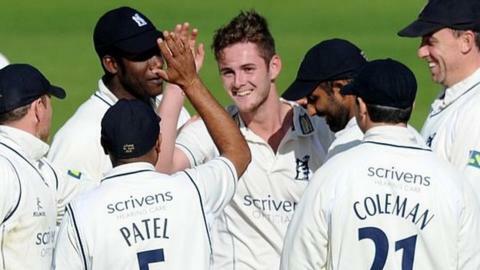 High Wycombe-born Pollock also made his first-class debut against Somerset last April, for Durham MCCU. The former Worcester Royal Grammar School pupil, who is studying at Durham University, also played for Herefordshire in the Minor Counties Championship last summer, making 227 not out against Shropshire. Warwickshire, now under the leadership of Ian Bell, are looking to improve on a season in which they finished fifth in Division One in the County Championship. In limited-overs cricket, the Bears came sixth in their One-Day Cup qualifying group and, as defending champions, were beaten on home soil at Edgbaston in the semis on T20 Blast Finals Day.